The service between Gourock and Dunoon town centres is now passenger only and operated by Argyll Ferries: you can find more information via the link to their website on this page. We will replace this page when we have travelled on and photographed the replacement service. In the meantime, this page is out of date and remains purely of historical interest. Those wanting to cross the Firth of Clyde from Gourock to Dunoon have a choice of ferry operators and routes. 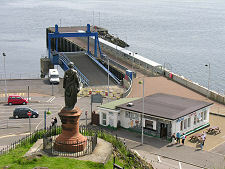 Western Ferries operates one service from McInroy's Point, at the western edge of Gourock, to Hunter's Quay, at the north end of Dunoon. We cover that service on a separate feature page. 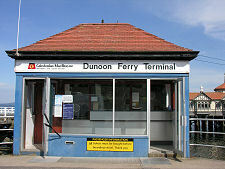 The second service, covered on this page, is operated by CalMac from a terminus in the centre of Gourock, near the railway station, to the pier in the centre of Dunoon. 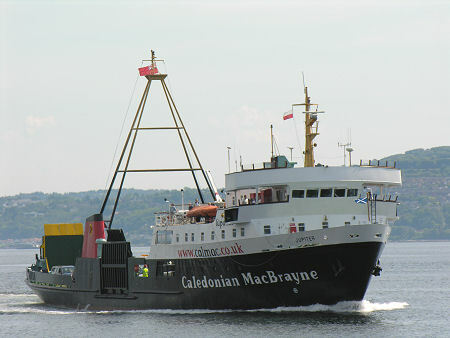 The crossing between Gourock and Dunoon is timetabled to take 23 minutes, and the single vessel used on the route maintains an hourly service each way from early morning until mid evening. Bookings can be made, and the route can be combined with others operated by CalMac as part of a "Hopscotch" ticket for those touring western Scotland. 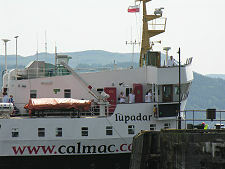 The vessel you are most likely to find operating the service is the Jupiter, one of CalMac's Streaker class ships. 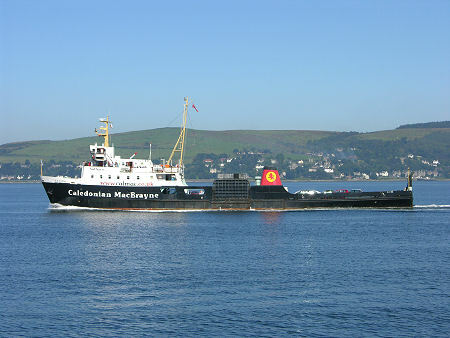 She was built in 1973 at James Lamont & Co. Ltd. in Port Glasgow for what today seems the very modest cost of £750,000. She can carry up to 40 cars and 510 passengers and loads via the rear ramp at Gourock and the side ramp at Dunoon. 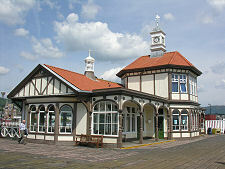 Casual visitors may well wonder why Jupiter continues to use Dunoon's Victorian pier, completed in 1898, when a new linkspan has stood unused a few hundred yards to the south since its completion in 2005. The answer lies in a complex and inconclusive bidding process for the route which the Scottish Government were compelled to undertake by the European Commission. The idea was that the successful bidder for the route would be able to dock state-of-the-art vessels at the new linkspan. But as no bids were ever actually received, CalMac continue to operate the service on an interim basis with Jupiter, which cannot dock at the linkspan. 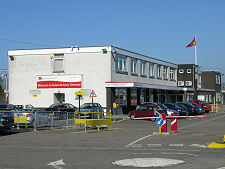 CalMac's services on this route date back to January 1954 when the Arran became the first car ferry to operate on the Clyde, later supported by the Bute and the Cowal. A number of different ships were used in the early 1970s, but in 1974 the brand new Jupiter and her sister ship Juno took over the route. 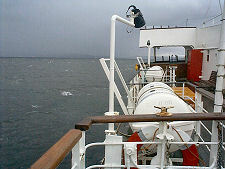 Since 2006 Jupiter has been the main ferry used on the route, with another Streaker class ship, Saturn, standing in when needed. Full information about the Argyll Ferries' services, including timetables and prices, can be found on their website. 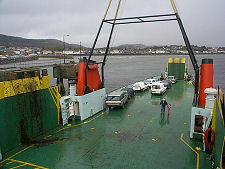 Full information about Western Ferries' vehicle ferry services from McInroy's Point to Hunter's Quay can be found on their website.